18 kinds(Japan) of Calanthe discolor that grow spontaneously in temperate regions are growing spontaneously in 5 kinds(Korea), Japan in Korea laying stress on Chejudo. It is characteristic that Calanthe discolor of Chejudo is growing spontaneously by kind according to height from above the sea 120m to 900m, and is growing spontaneously in fallen leaves broadleaf tree zone mainly. Calanthe discolor that is growing spontaneously in Chejudo is Calanthe discolor, Calanthe sieboldii, Calanthe bicolor, Summer-Calanthe discolor, Island-Calanthe discolor etc. 5 kinds. Specially, Calanthe bicolor grows spontaneously in place that Calanthe discolor and Calanthe sieboldii range, and the characteristic form and nature expresses characteristic form and nature middle enemy of two kinds, confirmed according to heredity analysis result by two stalks' nature disorder species (Hyeon MyeongRyeok . 1997 . Natural habitat mode of life of Chejudo self-generation Calanthe inside and classification school register research . Cheju national Univ . Doctoral dissertation). Also, Calanthe bicolor brags peaceful countenance that peaceful countenance of Calanthe discolor and Calanthe sieboldii is various and splendid being mixed, and utility value is high by flowering plant garden plant forward. Self-generations in Mt. Halla above the sea 120 - 600 m extent.Is ranging on northeast department that notification laying stress on Mt. Halla, and northwest is not many in ranch land rent's broadleaf tree leaves forest, but is growing spontaneously, and is limited in part area on southern part and is found. Length of petal and calyx of flower 1.5 - 2cm, width 0.3 - 0.8 cm, green color, brown, red color etc. be. Length of tongue place expresses 1 - 2cm, width express 1 - 2cm, white and pink. May first ten days of a month in April last third of a month flowering time. Calanthe discolor that is growing spontaneously in Chejudo by 20 species classification give a name. Self-generations in Mt. Halla above the sea 300 - 600 m extent. Is ranging in comparative wide area on most northeastward laying stress on Mt. Halla but can not find in west and is not found much so to southern area. Length of petal and calyx of flower is 1.5 - 3.5cm, width 0.5 - 1.3cm, yellow color. Length of tongue place is 2 - 3cm, width 2.5 - 3.5cm, most yellow. At the beginning of May in April last third of a month flowering time. Calanthe sieboldii that is growing spontaneously in Chejudo by 16 species classification give a name. Is found in place that Calanthe discolor and Calanthe sieboldii grow spontaneously at the same time in Mt. Halla above the sea 300 - 400 m extent. Length of flower leaf and flower support expresses diverse peaceful countenance that peaceful countenance of Calanthe discolor and Calanthe sieboldii such as 1.5 - 3cm, width 0.5 - 1cm, yellow that green color mixs, green, grenadine is mixed. Length of tongue place 2 - 3cm, width 2.5 - 3cm, white, yellow, pink, red color etc. be. 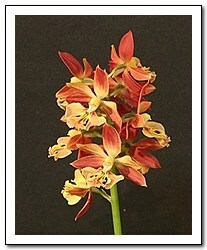 Calanthe bicolor that is growing spontaneously in Chejudo by 22 species classification give a name. Calanthe bicolor's name is that come from Prunus yedoensis that is chief mourner special product, because "Prunus yedoensis" is superior disorder species that is expose by heterosis of "P . Pendula for . Ascendens" and "P . Sargentii". That is, disorder stalk of superior characteristic form and nature that is appeared by nature disorder of Calanthe discolor and Calanthe sieboldii is attached in intention.